Policy required employees to work one year. Under California law, terminating employees must be paid for the value of their unused, accrued vacation time. California law, however, doesn’t require employers to provide vacation at all or even to provide it under any particular formula. An employer’s vacation policy stated that all employees would receive one week of vacation after being on the job for one year and two weeks of vacation after working for two years. The policy explicitly informed employees that vacation pay didn’t accrue 1/12th of one week’s vacation accrual each month during their first year. An employee terminated after about six months and sued after he wasn’t paid for any of his vacation time. Employer: The vacation policy unambiguously states that no vacation time is earned during the first year of employment. A state trial court ruled for the employer and the employee appealed. No forfeiture here. On appeal, the employee argued that the employer’s vacation policy was illegal because it allowed for forfeitures if employees didn’t work for at least one year. The appellate court agreed that vacation policies that skirt the law wouldn’t pass muster, but it said that’s not what this employer did. Appeals court: An employer may lawfully decide that it won’t provide any vacation at all. By logical extension, an employer can properly decide that it will provide paid vacation after a specified waiting period. The employer, therefore, was off the hook for the vacation pay. SEE YA: Some states require you to cash out the value of a terminating employee’s unused, accrued vacation days. The chart below summarizes those state laws. Other states have no laws, which means that company policy should apply. 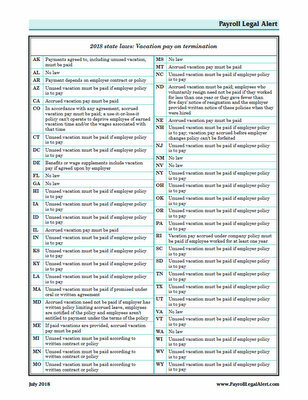 Caution: To get the full story on state final pay laws, contact your state labor department.